← What Price A Comeback? It’s hard to know how to talk about TRACKERS without giving away too many of the book’s surprises which come from both story and structure so I shall err on the side of caution. I don’t think it’s letting too much out of the bag to say that there are three distinct books here, and though the reader assumes the stories will eventually intertwine most connections are not made until almost the very end so you are really reading three independent stories. While this maintains suspense it does require more than the usual amount of small-detail retention on the part of the reader, something that proved quite challenging with the audio version of the book. The first and most prominent of the three stories centres around a woman called Milla Strachan who, when we meet her, is just coming to the decision to leave her violent, philandering husband and their boorish, spoiled son. Although she trained to be a journalist she has not worked for many years and struggles to find a job until she spies a small newspaper advertisement. That leads to a report-writing job with a government agency. In the second book we meet a young freelance bodyguard called Lemmer who is hired for the seemingly innocuous job of escorting two endangered rhinos being smuggled into the country from Zimbabwe on behalf of a wealthy and slightly dodgy farmer. 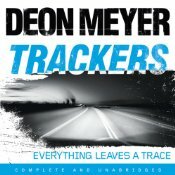 In the final book of TRACKERS we follow the trail of former policeman Mat Joubert as he starts his new job as a private investigator and takes on the case of a missing husband whose wife is unsatisfied with what she perceives to have been a fairly cursory investigation by police. All three stories are compelling in their own right though I have to admit to finding the first one a little tough-going in parts. Although the audio narration was excellent I found the very complicated plot a little hard to follow in this format and did have to rewind quite a bit which is something I very rarely need to do. I had no such problems with the other two books within this book and perhaps for that reason I enjoyed those two stories slightly more than the first. There are several elements which link the books, the most obvious being that each depicts some version of tracking; be it people, animals, objects or something less tangible. This could have been clumsy in a less talented author’s hands but Meyer is a terrific storyteller and manages to use this device almost without the reader noticing it’s being done. Another theme common to the stories is that the main character in each one is at something of a crossroads in his or her life and the events cause, or force, them to learn something not entirely comfortable about their own makeup. Milla Strachan’s case is probably the most dramatic of the three but these threads are all fascinating and provide part of the depth of this book. The remainder of that depth comes from the other thing which links the books which is the ever-present commentary on life in modern South Africa. It is almost as if Meyer has written a non-fiction book underneath the fictional one in which he is depicting a year in the life of his country. Setting the main part of the story in the time leading up to the country’s hosting of the football (soccer) world cup offers scope to show how the country and its residents want to be seen on the all-important international stage, while the disparate stories within TRACKERS allow a broad cross-section of ‘routine’ lives to be depicted which helps readers build up a real picture of the country today. Again it is something you almost don’t notice until the book is finished when you suddenly realise you have such a detailed picture of the place that you feel like you could walk into the pages and feel at home. I think I’ve only scratched the surface of all that is good about TRACKERS so can only recommend you read the book for yourselves, though I’d only recommend the audio format to seasoned listeners. It is an intelligent, compelling thriller with a fantastic range of characters and an absorbing sense of place. At a time when many successful writers seem content to write the same book over and over again Meyer is to be applauded for continuing to stretch himself and his readers. I’ve reviewed three of Deon Meyer’s other books Devil’s Peak, Dead at Daybreak and Thirteen hours. There hasn’t been a dud in the bunch. Bernadette – Such an excellent review! Thanks for sharing it. I think your very last sentence is quite telling. Meyer really does innovate and stretch for that I too really respect him. A superb review Bernadette. Thanks for bringing back memories of my reading. If you liked Lemmer here then you should really enjoy Blood Safari! Bernadette, you will enjoy Blood Safari; and I agree Trackers is one of the best thrillers I have ever read. I really liked Blood Safari, it was the first of Meyer’s books I’ve read, and it was nice in Trackers to see what Lemmer was up to. Joubert, too, after 13 hours (and previous books of course). Great review, I’m so glad you liked it as reviews seem to be mixed – either love it or “why has he stuck together fragments of a few novels?” type of review. I agree that at a time when so many formulaic thrillers are being churned out it is great to read a book that’s exciting, intelligent and structured in an original way.